I don't need to tell you this part, do I? The channel just had its fifth birthday on Monday, and since just about everyone owns a Wii, everybody knows about this. So there's this thing on the Wii called Everybody Votes, where people read silly questions like "Are you happier when it's sunny or snowing?" and then everyone picks an answer and you can see what people said and where people said what and such. It's pretty silly but it's also kind of fun. There are usually a number of questions up at a time, constantly being updated, and you can even suggest your own questions for people to vote on. I still don't understand why they never chose my question. 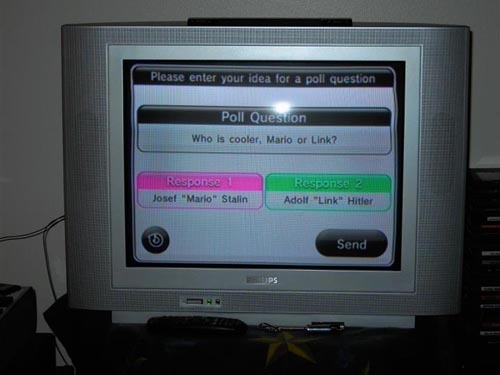 So when my brother was still in Michigan we'd do this on his Wii, answering questions. Usually they're simple opinion questions ("cake or pie? "), but every so often you'd get weird fact questions. So one time we got the question, "What is a rhino's horn made of?" The choices were "hair" or "bone". Now, in case you didn't know, a rhino's horn is made of keratin, which is basically the same stuff as hair. There's no bone in a rhino horn. So the correct answer is "hair". But Everybody Votes doesn't just let you choose an answer - you also get to predict which answer you think will win. So my brother and I both select "hair", but now we have to decide what everyone else will say. Because Everybody Votes isn't checking for the correct answer, just the more popular answer. So my brother, having faith in human intelligence, decides that "hair" will win. I, having no faith in humanity (or at least Wii owners), guess that "bone" will win. "Bone" won. By a decent amount, if I remember correctly. I think this still makes my brother sad.